I’ve got a laser. Sure, you probably have one too. When I was a kid, lasers were crazy big expensive things you would never own. They involved tubes of gas and high voltage power supplies. Today, you can hold a pretty powerful laser in your hand. The future is now! Right, but really, I’m just talking about a laser pointer. We’ve all used those. I got one years ago for less than $8 and had fun making the cat chase it around. It was a tiny little laser with tiny little batteries. It was bright for a few minutes, and then got dimmer, and then when the batteries died I found out that buying new batteries cost almost as much as the laser pointer itself. Bummer. As chance would have it, I was in need of a laser for some crazy top secret science experiments I can’t discuss yet, and did a little bit of research into lasers. Those folks at Wicked Lasers seem to have quite a variety, and they appear to be of pretty good quality as well. There’s cheapo lasers on ebay, most of which tell you the output, which is about 10 times the actual output of the laser. A laser with a high enough output will allow for things like burning or cutting. 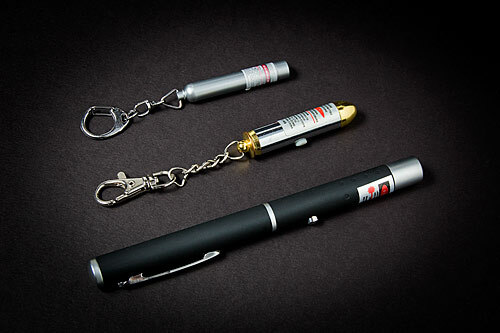 You’re typically not going to see that in a hand-held laser pointer, and you probably shouldn’t! The <50mw 532nm Astronomy Powerful Green Laser Pointer comes in under $12, add $7 for shipping and you’re still under $20 for a frickin’ laser! Now, this is not a 50 milliwatt laser. In fact the name of the product says “<50mw” which I assume means “less than 50mw” or something. The description does say “True 50mw factory tuned green laser pointer” and “Output power: 50mW” but some of the review suggest it’s probably between 5 and 10 milliwatts, which is fine with me. This laser is bright. Green lasers will appear much brighter to the human eye than red lasers, and if you point it at a wall and stare at the dot it makes for too long, it’ll start to hurt your eyes. Disclaimer: Lasers are dangerous! Don’t point it at eyes, planes, or vehicles. If you’re careful and treat it responsibly, it’s fun to experiment with. As for those crazy top secret science experiments I can’t discuss yet… Hopefully we’ll have some future posts about those. Off to the lab! Blogging Nerd Note: I was wondering why WordPress added a ‘-2′ to the post URL, but then realized I wrote a post titled Frickin’ Lasers! back in 2006. Funny, eh? Posted on Sunday, May 29th, 2011 at 8:10 am. Subscribe to the comments feed. Both comments and pings are currently closed. Post on your own blog.